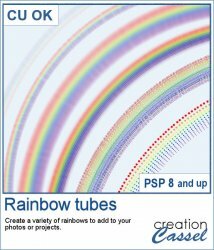 PaintShop Pro is a powerful graphic program for many uses including digital scrapping and designing. In this store, you will find a variety of top quality tools specifically designed for use with PaintShop Pro. Most of the products are designed as tools for you to save time, create elements with precision, but mostly to let you personalize the products to suit YOUR idea. Most scripts will let you choose among many options, or even use your own starting elements. 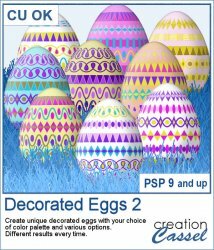 Whether you are using an older version (PSP8) or a newer one (PSP 2019), you can use almost all the products in the store. And if you are not a PaintShop Pro user, you can still take advantage of other products, particularly the fonts. If you are looking for a particular PSP product and cannot find it, please contact me and suggest your idea. I might be able to create it and if I do, you can get it free in exchange. So do not hesitate to let me know of scripts, tubes, or other products you would like to see in the store. All products in this store are downloadable. You will get a download link after your purchase. No physical product will be sent to you. If you want to stay informed of the new releases in my store, you can subscribe to my newsletter. The newsletter is sent weekly and includes links to giveaways, previews of the new releases, live classes announcement, PSP tips and tricks, and sometimes, some surprise sales and coupons. Are you new to using PaintShop Pro? Are you already comfortable with PaintShop Pro but you want to learn more advanced techniques? Join the Scrapbook Campus for a unique learning experience in the world of graphics and memory keeping with PSP.